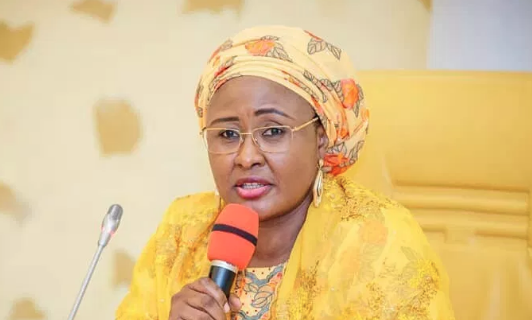 ABUJA: Wife of the President, Aisha Buhari, on Saturday, urged Nigerians, irrespective of tribal, religious and other sentiments to vote for President Muhammadu Buhari in next Saturday’s Presidential Election, saying, contrary to what opposition propagandists would want Nigerians to believe, that her husband is a president for all and not a sectional leader. This came even as a former Inspector General of Police IGP, Suleiman Abba, accused the Peoples Democratic Party, PDP, of engaging in unnecessary propaganda. The rally which saw thousands of Buhari supporters staging a walk from the Unity Fountain to the Eagle Square, also had in attendance the Minister of Youths and Sports, Solomon Dalung, former Military Governor of Lagos State, Buba Marwa and a representative of the FCT Minister, Muhammad Musa Bello. Others were the Senior Special Assistant to the President, Dr Hajo Sani, and the wives of Ogun, Nasarawa, Borno and Ondo states’ governors, Olufunsho Amosun, Mairo Al-Makura, Nana Shettima and Betty Akeredolu respectively. Aisha, who was represented by, Dolapo, the wife of the vice president, Yemi Osinbajo, also advised APC supporters to stay back around their polling units after casting their ballots on election day. According to her, “By walking today, you are telling the world that you are standing with Buhari and the APC. “Our president is for everybody whether men, women or youth. Our president is for the whole of Nigeria. There is no discrimination. Only yesterday, a train left Lagos and arrived in Abeokuta. We have not seen that in a long while. Buhari has shown that he is worthy of our trust and, APC going to the next level means that Nigerians are also going to the next level,” she declared. Mrs Buhari also tasked supporters on the need to be vigilant on election day rather than going home after voting. “After you have voted, you must not go back and sleep. You must wait for your votes to be counted and then you write it down,” she urged, advising Nigerians to comport themselves and eschew electoral violence. Earlier, in his welcome remarks, Abba said election rigging was alien to the APC, and accused the PDP of corrupting the electoral space. “APC do not know how to rig election at all. Who are the masters of ballot box snatching? PDP. Who declared results in 2007 before the official results came out? PDP. While they are embarking on propaganda, we are focused on our door to door campaign”, the former IGP stated.